A cozy, chic, and gorgeous three bedroom villa with colonial designs and Southeast Asian flavor, all with a modern twist. The Villa is sure to romance guests with its abundant coconut trees and an expansive grass lawn that stretches into the ocean, which is just a few feet away from the villa. 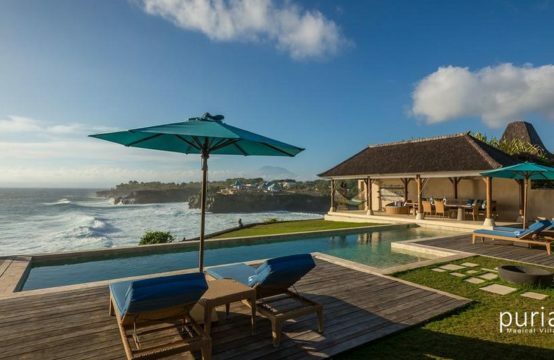 Located in tranquil Amuk Bay in Candi dasa, Villa Stella is going to be a holiday you won’t forget. A gorgeous 25 meter pool where you can take a swim and lounge on the beach recliners. In the evening, you can stay on the sandy verandah and have dinner by the sea, enjoying some delicious barbecue as you delight in the cool sea breeze. If you want to take a swim or snorkel and enjoy the marine life, the ocean is only a few feet away. Villa Stella boasts stylish living spaces that adds character while providing you with utmost comfort. The Villa is designed with an interesting blend of antique pieces from Sri Lanka and Java and modern furniture. Art pieces and wooden antiques decorate the living rooms and guest bedrooms. However, despite its traditional Southeast Asian flavor, guests won’t be wanting for more modern amenities. Equipped with a full kitchen and viewing entertainment, Villa Stella is perfect for families and friends. Villa Stella has three guest bedrooms that also boast furniture and decor with a unique blend of the old and new, traditional and modern. You can relax and rest easy, maybe even do some Yoga in the comfortable guest bedrooms. Each bedroom has a private bathroom with a clean and modern finish. The best part of each bedroom is that you can be lulled to sleep by the ocean’s waves as each room has a brilliant view of the sea. Having friendly and accommodating staff adds an extra special touch to an already memorable trip. 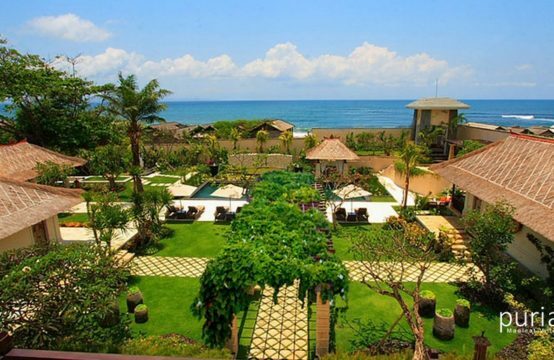 At Villa Stella, you’ll experience only the best of Balinese hospitality. While the guests pay for the market cost of the groceries, there is an in-house chef who will cook meals which will delight your taste buds and excite your senses. If you want to “live like the Balinese”, you can also go with the chef to buy the groceries and look at the various sights, tastes, colors, and smells the local market has to offer. The staff at Villa Stella can help you arrange even more exciting and relaxing adventures such as, diving in Amuk bay, visiting a nearby temple, or having a massage in a private villa Bale. Whatever your fancy, the staff will be happy to arrange it for you. Villa Stella features three bedroom suites, where two are located on the first floor and one is on the main floor adjacent to the living area. The bedrooms are spacious and have king-sized beds, daybeds, Victorian sofas and a luxurious ambiance. There is beautiful artwork behind the beds and each room sports a different color scheme. There are televisions and vanities in each room as well for your ease. The air-conditioned bedrooms all open out to a private terrace which is furnished with chairs so you can enjoy a cup of tea while you gaze out at sea. All three bedrooms have expansive en-suite bathrooms with outdoor freestanding bathtubs, while inside the bathrooms, you will find the shower areas. The expansive and well-furnished living pavilion boasts of two levels, which are connected via opposite staircases creating a royal look. The bright and cheerful room opens out directly to the garden and the pool and since it is located at a height, you can view the scenic beauty of Amuk Bay from the sofas that are in the center. With an all-white décor, the room is highlighted with bright blue colors of the sea for a wholesome, tropical ambiance. On the wall behind the sitting area, there are numerous snapshots of Balinese culture and heritage. The room is decorated with traditional artefacts collected from around the world and other Balinese knick-knacks. The dining area is one the same level and is separate by shutters, it comprises an 8-seater dining table with designer chairs. As you climb the steps, you will reach the stunning terrace which lies beyond the glass doors that light up the entire room. This too serves as an excellent vantage point for viewing. When the world is your oyster, there is not much that will deter you from relishing the breathtaking beauty of the glistening sea, the clouds overhead and the mountainous regions that can be observed from the villa. The 25-metre infinity-edge swimming pool is where you can float around or merely lounge as you gaze at the open sea and the skies above. With towering palm trees bordering the periphery, the image is one that will calm your senses and soothe your soul. Sun chairs are where you can lounge and sunbathe, and as you descend the steps, you will reach the sandy recreation area which is furnished with an alfresco dining situation, a traditional Bale with daybeds, and more sun chairs which are directly facing the sea. This romantic setting would make for the perfect meal outdoors in the fresh air.